Daniel Chester French created this Minuteman Statue at Concord and the Francis Parkman Memorial and John Harvard statue. Henry Hudson Kitson created this Minuteman statue at Lexington and the Roger Conant statue at Salem. George Washington’s Prayer at Valley Forge by Arnold Freiberg. George Washington at Dorchester Heights (Boston) commissioned by Samuel Parkman painted by Gilbert Stuart original at Boston Museum of Fine Arts and copy at Fanueil Hall. 2. William Parkman, son of Rev. Ebenezer Parkman, fought at Ticonderoga. 3. Breck Parkman, son of Reverend Ebenezer Parkman, was a Minuteman from Westborough, MA. See also his brother, Sergeant Ebenezer Parkman, Jr., #15 below. Lieu. Josiah Converse died Sept. 11, 1775 in the 65 year of His age. Stone is split and buried somewhat to keep pieces together. Converse Family is well known in Stafford’s history. In 1829 came John Flora and wife, Mary Ott, with their family to Illinois, reach his destination in the latter part of December. He moved his family and effects in four wagons drawn by horses, and at length reached John’s Hill. Decatur had just been laid out, and Springfield was a market at that time. Mr. Flora entered the land from the Government, and in a log cabin the family lived in true pioneer style, dressing in buckskin and wearing coonskin caps. Their beds were made of poles inserted between the logs, and clapboards were placed up these. There were thirteen children in the family, hence the household was a large one. In Virginia the father owned a saw and grist mill, but after coming to the West he carried on agricultural pursuits. He became well-to-do, and, although he had served in the Revolutionary War and was granted a pension, he would never draw the money. Joseph Brownlee was the first husband of Elizabeth Guthrie. He served during the Revolutionary War with Capt. Joseph Ervin’s Company which was raised in Westmoreland Cty. Pa. He made 3rd Lt. on April 15, 1776, 2nd Lt. on Oct. 24, 1776 and 1st Lt. on April 18, 1777. He was captured at the battle of Long Island on July 27, 1776 and released in a prisoner exchange Dec. 9, 1776. He resigned on June 22, 1777. He married Elizabeth Guthrie in 1775 and they had two children, John & Jane. Joseph was an Indian fighter on the frontier. On July 13, 1782, while attending a wedding at Miller’s Blockhouse at Hannastown, Indians attacked. They burned Hannastown and took captives. When learning of Joseph’s idenity, they killed him with a hatchet blow to the head. His 3-year-old son John was killed as the Indians slammed his head to a tree. The others in the party were taken captive as was his daughter Jane, who was only 4-months old at the time. His wife Elizabeth was taken as well. (SEE THE PAGE FOR ELIZABETH GUTHRIE FOR DETAILS OF HER CAPTURE).Elizabeth Guthrie was the wife of Capt. William Guthrie. They had 10-children. Elizabeth Guthrie gave an account of the burning of Hannastown on July 13, 1782 and her experiences as a captive of the Indians in her petition to the Pennsylvania State Legislature. Elizabeth was the daughter of John Guthrie & Jane Reed. Before her marriage to Capt. William Guthrie, she was married to Capt. Joseph Brownlee. In the attack by the Indians on Miller’s Blockhouse on July 13, 1782, the Indians killed Elizabeth’s first husband Capt. Brownlee and her three year old son John, and took her, her four month old daughter Jane, and several others prisoner.The Indians took them to Buffalo and to Niagra where Elizabeth was sold to British officers for $20.00. Jane was sold also for $10.00 and two gallons of rum. The British took the captives to Montreal as prisoners of war. They were there exchanged for British prisoners and returned to Hannastown, Pa. in July of 1783. Elizabeth married Capt. Guthrie there one year later in July of 1784. Daughter Jane grew up, married James Hugle and moved to Muskingum County, Ohio. (SEE MY PAGE FOR CAPT. JOSEPH BROWNLEE FOR INFO ON HIS DEATH AT HANNASTOWN’S MILLER’S BLOCKHOUSE). ______________________________________Thanks to Betty Rudolph of Boise, Idaho for the photo of the Brownlee grave. ______________________________________THANKS TO Al Haxton for the following information:Meckling Farm grounds is now known as Meadowlane Farm. You might want to add this so people can find it. 15. Sergeant Ebenezer Parkman, Jr.
Col and Engineer in the late American War. Brother of: Luke Baldwin, Col Nahum Baldwivn, Captain Isaac Baldwin. Spouse: Lucy (Parkman) Baldwin dau.of Rev.Ebenezer Parkman (d.1782 Westboro,MA) of Westboro,MA. *Jeduthan Baldwin, killed by being thrown from a cart 31 Oct 1763- 6 yrs old. 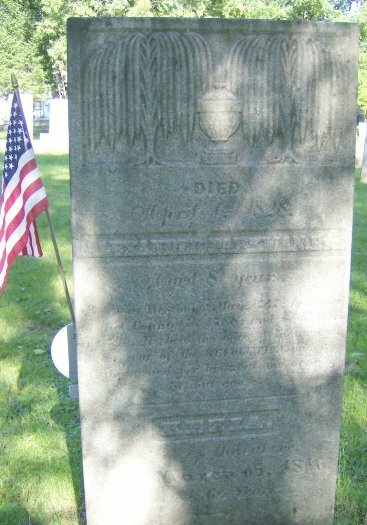 Be it remembered that here lies the body of Jeduthun Baldwin, Esq., Col and Engineer in the late American war, who died Jun the 4th, 1788, Age 56. He was a true patriot, an (intrepid) soldier, an exemplary Christian, and a friend to all mankind. Blessed are the dead who die in the Lord. In memory of Capt. William Belcher, who died June 27th, 1801, in the 70th year of his age. And bids it wing its heavenly flight. “We have to late Advices from the Fort Prince-George (the outmost fort in the Cherokee Indian foothills town in what is now Oconee County) of any Consequences from places on that Route but from Fort Moore (a fort opposite Augusta and on the South Carolina side of the Savannah river) we learn that a Gang of 18 Cherokees divided into 3 or 4 Parties, on the 15th instant way-laid, killed and scalped Ulrig Tobler, Esq, a Captain of Militia in those Parts as he was riding from his Father’s to that Fort and shot Mr William Calhoun, who was with him, in the Hand; 3 other Persons who were in Company were unhurt; the Indians who killed Capt Tobler left a Hatchet sticking in his Neck, on which were 3 old Notches and 3 newly cut.”Several of the Settlers were found hiding in the woods by the men who well-armed and in numbers returned to search for the victims. ~~~Patrick Calhoun, of the original brothers who settled in the Long Canes, found his niece, REBECCA CALHOUN, daughter of his brother Ezekiel Calhoun, hiding in a Cane Brake. This Rebecca Calhoun afterwards married Andrew Pickens, who was a Brigadier General in the Revolution, member of Congress, the father of Andrew Pickens who became Governor of South Carolina in 1816. Gen Andrew Pickens declined the offer of being made Governor of South Carolina but his son, Andrew Pickens Jr did serve, and had a son, Francis Wilkinson Pickens, who like his grandfather, was a member of Congress and was Ambassador to Russia just before the War Between the States and in 1860 became the “War Governor of South Carolina.” These were descendants of the young Rebecca Calhoun who escaped the night attack of the Indians not far from Patterson’s Bridge over Long Cane – remembering, of course, that there was no bridge over Long Cane at that place or any other in those early times. There was a ford there and tradition is that the pursuing Indians had almost given up hope of catching up with the fleeing whites but some of the “Waggons” (the old spelling) got stuck in the bog and the noise made in trying to get the horses to pull the “wagons” and carts out of the bog reached the ears of the Indians and they came on. They did not attack, however, as the Gazette account states, until after nightfall and while the whites were off their guard, getting ready to feed the horses and have supper themselves and with their guns all hidden or covered up in the wagons and carts. Nancy b. 22 Sept 1800, co. before 1850, m. Col. Patrick Ewing. The Parsons Burying Ground was the burying ground for the Thomas Parsons family who came to the area in 1841 and built the large brick house (now on Lee Street, Defiance). They had bought the property from Joseph Haines family. Weather Joseph who d. in 1834 is buried there is not known. The site was used as a cemetery as early as 1811 when Mary A. Moore dau of Zachariah and Alice Moore was buried there. Several others were buried there prior to the arrival of the Parsons family. The first Parsons family member was buried at this site in 1851. The property was in the Parsons family for over 100 years. In the book on St. Charles County Cemeteries it is noted that the Burying Ground was now known as the Pleasant Hill Memorial Methodist Church Cemetery. The old Pleasant Hill Methodist was a mile south of Defiance on Howell Road. That was the site of the Darst Family Burying Ground and in the 1850’s when the Darst family sold land there for the first Pleasant Hill Methodist Church it became the Pleasant Hill Methodist Cemetery. Later after the church was destroyed in a storm the decision was made to rebuild in the village of Defiance. They and the Parsons family maintained the cemetery till the Parsons family sold the property, and the Pleasant Hill Memorial Methodist Church took over the maintance of the Cemetery. This occurred in the 1980’s. Alexander Parkman’s cousin George Parkman was an American Revolution Veteran. This entry was posted on March 8, 2009 at 1:52 pm and is filed under Uncategorized. You can follow any responses to this entry through the RSS 2.0 feed. You can leave a response, or trackback from your own site.